Even though I live all the way in Australia I look forward to Coachella every year for it's amazing fashion snaps! Every year hundreds of guys and gals manage to put on their Sunday best for my personal visual enjoyment! I really hope that one day I will get to Coachella! 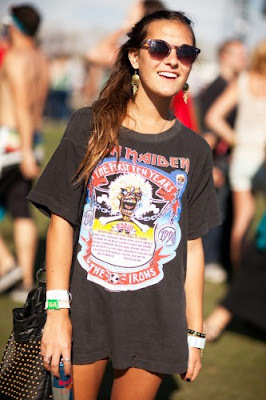 It is my dream to be happy snapped by a style stalker at a festival! But why don't they photograph the curvy girls? Some of them must be stylish? Or don't curvy girls go to festivals like Coachella because of the intimidating mass concentration of skinny beautiful women? Fair enough, but I'm still going! these outfits are amazing! i really like the bright green bag in the second to last pic. how i wish i had this kind of f-awesome festival in my country! coachella give us some inspiration!!! like your blog! following you on Bloglovin! folow back if you like!